Additional shipping required for this oversized product. This will be calculated into your total on checkout and depends on your chosen shipping method. Ground - $22.35; 2 Day Air - $74.25; Alaska & Hawaii - $75.35; U.S. APO & FPO - $55.85. 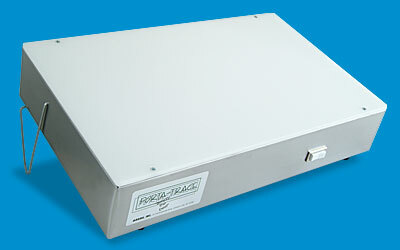 The newly redesigned GAGNE Porta-Trace light box virtually eliminates the "hot spots" found in competitive units. The new frames and reflectors - combined with the thick plexiglas top - provide uniform and even lighting over the entire durable, stable viewing surface. It's size is perfect for working with tattoo designs. The GAGNE name is synonymous with quality and dependability and Spauding Enterprises offers this product at an exceptional price. 11" x 18" x 3"